Streaming video on the web has become quite popular and Adobe has been the king of the hill for a long time with its Flash Video format. 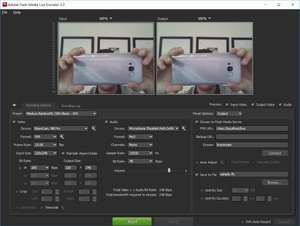 This software is an official Adobe program which can deal with multiple streams simultaneously while providing a number of tools for live feeds from webcams and other video input sources. The main interface of Adobe Flash Media Live Encoder is easy-to-understand despite the number of options and tools the program offers. Virtually all of the encoding options here can be configured quickly and from the main interface. Version 3.2.0.9932 is a freeware program which does not have restrictions and it's free so it doesn't cost anything. For security reasons, you should also check out the Adobe Flash Media Live Encoder download at LO4D.com which includes virus and malware tests. Additional screenshots of this application download may be available, too.